The first comment is that I – as many others – am not a fan of the word ‘disruption’, which has lost much of its meaning through misuse and overuse in recent years. However I cannot find a better word for what is meant here. I’m very open to other suggestions! Overall the intent of the framework is to distinguish between the different layers that are driving disruption, from the underlying forces, through the high-impact developments and finally key structural shifts. These are often confused, making the mechanisms – or vectors – of disruption far harder to understand. The framework is of course immensely simplified. There are many other elements that could have been included, such as demographics, however many of these will play out over a longer period. The most common focus is on Information technologies, with past future exponential growth in Data, Processing, and Connectivity, which a long runway yet for these trends. 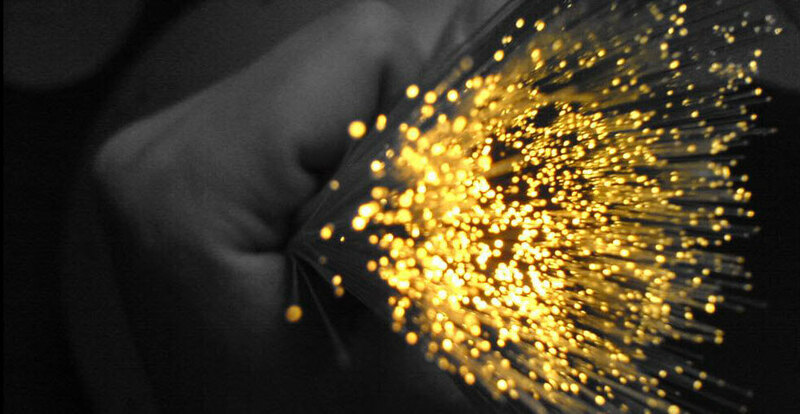 Advancing Interface technologies are also critical in giving people far deeper engagement to information. Technologies in other domains, including Materials, Health and Energy are also impacting not just these industries, but many others, including construction, infrastructure, manufacturing and transport. Expectations are continuing to rise on every front. Societal expectations, notably of sustainability and accountability, seem to be shifting into higher gears. Customers are demanding powerful experiences and customization. Another important force is that of shifting Investor expectations, who not only expect consistent growth, but also scalability and constant renewal. Here we can catalog the array of technology buzzwords that soak through almost every business presentation you are likely to see this year, such as AI, Robotics, Big Data and VR. While these developments are hyped, they individually are likely to have a massive impact on business and society, and even more when they are combined. However there are also important non-technological developments, including Power to the individual and active Capital reallocation by investors. While it is bold to point to only two fundamental structural shifts in the economy, I believe they will be responsible for the majority of structural change in coming years. Automation in manufacturing has already significantly played out, however we are really just at the beginning of the impact of automation – as the application of AI and robotics in a work context – on not just almost all job roles, but how organizations function. Platforms are the fundamental mechanism underlying the network economy. Beyond the evident rise of marketplaces in transport, accommodation, work, and many other domains, platforms also encompass blockchain and crypto-currencies, open innovation structures, and new models of reintermediation. It is clear that these forces, developments and shifts mean that existing Business models are unlikely to be sustainable without changes, sometimes evolutionary, sometimes revolutionary. However we also need to focus on other domains of disruption, including Organizational structures, Urban structure, Education and the Role of Government. Perhaps most importantly there is potentially massive disruption to existing Social structures. Understanding and shaping this in positive directions – to the degree possible – is everyone’s responsibility. 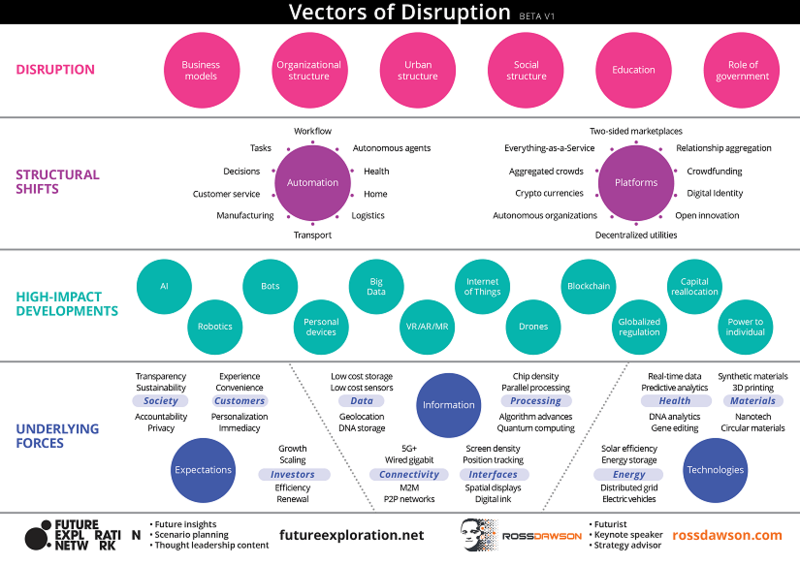 Of course this framework only looks at the vectors and structure of disruption, not the responses or solutions. I will be creating other frameworks soon that focus on what we need to do to create successful outcomes in a disrupted world. As always this framework is released as a Beta v1, not intended to be final, but a first attempt that will be refined over time if useful. So please let me know your comments, ideas, and constructive criticism so that can be incorporate into subsequent versions.